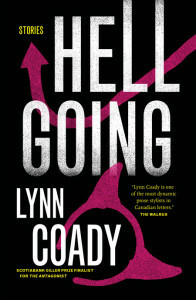 Yesterday, Lynn Coady won the Scotiabank Giller Prize 2013 for her collection of short-stories called “Hellgoing”. In an emotional speech, she thanked her husband, her parents and her publisher. She also added that she was proud to be a Canadian writer, especially since authors were treated like movie stars in our country. With astonishing range and depth, Scotiabank Giller Prize winner Lynn Coady gives us eight unforgettable new stories, each one of them grabbing our attention from the first line and resonating long after the last. Did you watch the Scotiabank Giller Prize 2013 ceremony yesterday? Are you going to read “Hellgoing”? I do read award winning books from time to time, but it’s true that most of them are dramas and usually pretty sad. I don’t know yet if I’ll read Lynn Coady’s book. I have such a long list of books to go through! Too many books, too little time!